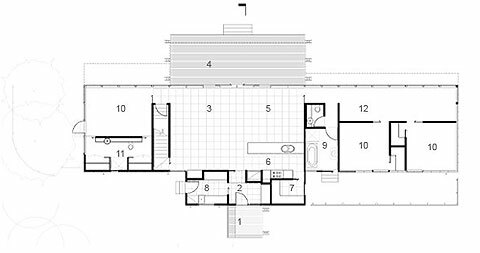 The Bells Beach Modular House is a prototype of our exciting prefab concept. All building materials adhere to a strict 300mm module such as 1200mm windows, 600mm internal floor pavers, 1200mm external steel cladding and 2400mm strawboard internal wall lining. This allowed use of standard-size off-the-shelf materials, lowering cost and minimising material wastage. 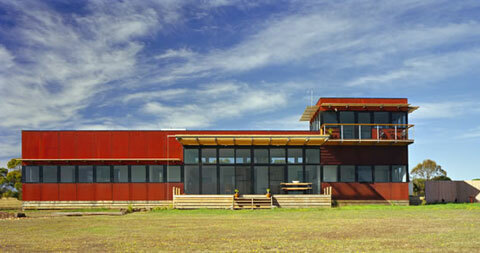 It is a linear house, oriented to capture the northern sun for maximum passive solar gain. The robust form blocks cold south-westerly winter winds but opens up to capture cool southerly summer breezes. The rusty red Cor-ten cladding reflects the red cliffs of the Surf Coast and requires no maintenance in this harsh environment. The building is raised off the ground to take advantage of the 360-degree views of the sea and countryside."